Houston thrives on the energy industry, its world class ports, and the manufacturing and industrial base that define the city. 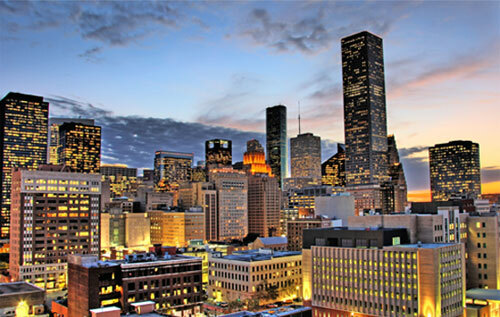 With its focus on energy and heavy industry, Houston Texas is a dynamic market for materials handling. Cisco-Eagle helps customers in manufacturing/assembly, shipping, distribution, warehousing, and other commercial operations optimize their operations for speed, safety, and space utilization. The demands of heavy duty handling systems require a high level of expertise and experience. We can help you accomplish your goals! Contact us today, and we'll get started. Our Service and Maintenance is active with many Houston companies, helping them to increase efficiency by reducing downtime and increasing reliability. Cisco-Eagle is Houston's local experts in conveyors and conveyor systems. We have designed and integrated systems in many of the regions top manufacturing facilities and distribution centers. We design and install from the smallest of work platforms to full sized mezzanines that incorporate conveyor lines, in-plant offices, sorters and spiral conveyors. Our work platforms meet all OSHA and ANSI requirements and are available in seismic zones. Between having one of the nations busiest ports and being at the center of the oil and natural gas industry, Houston relies on Cisco-Eagle to provide storage solutions for pallet freight, pipe, conduit, and drums & barrels. If it needs to be off the ground, we can help you get it there. We provide scissor lifts, jib & gantry cranes, dock lifts, air balancers, stackers, dock lifts and more. Theft and pilferage is a problem for any business and we're here to help you solve it. We offer pallet rack enclosures, steel cabinets and wire cages to store your valuable assets as well as large partitions for server rooms, holding cells and tool cribs. Down equipment or machinery can cost dearly and our emergency phone line is available 24/7. Our expert technicians are highly skilled in getting you back up and running and can set you up on a preventative maintenance plan to help prevent future problems. Our engineers have helped many companies make the move to automating their production, picking/packing, sorting and palletizing processes. Robotics and automation can reduce accidents, improve quality and increase overall output. Carousels bring the product to the picker in order fulfillment operations. Items can be stored in a more dense space while reducing downtime spent walking to pick the next order. We can help you layout and design shelving projects from a small room to an entire warehouse. We offer rivet, steel, expanded mesh, chrome wire and bulk shelving. Ideal for first-in, first-out inventory rotation. Gravity racks are loaded from the rear while order pickers pull items from the front. As an item is removed, another glides into place on skatewheels or roller tracks. Cisco-Eagle has a team of experts who specialize in facility and plant safety. We are dedicated to helping local companies reduce workplace accidents and financial costs associated with them. Packaging workstations, shipping/receiving workbenches, shop desks and stainless steel work tables are just a sample of what we provide.